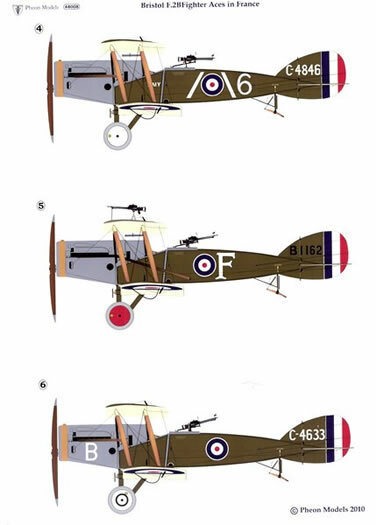 Pheon’s latest releases are Bristol F2B ‘Biff’ Aces in France and an updated and expanded reissue of Sopwith Pup markings in 1/72 scale. This is a good selection of squadrons and aces including the top scorer in the type, Andrew McKeever. 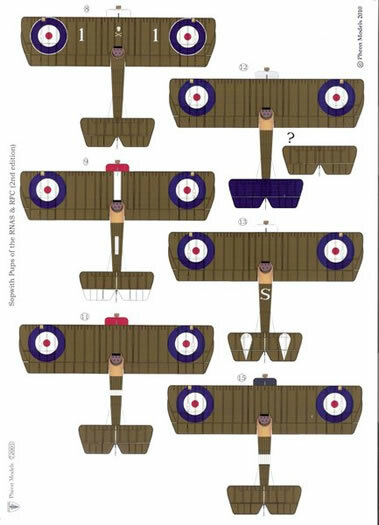 Some modellers may find the markings are not particularly colourful (which is true of RFC aeroplanes generally), but as Pheon rightly point out, the lack of personal embellishment is a mark of the Biff Boys’ values, ie. teamwork and modest courage. 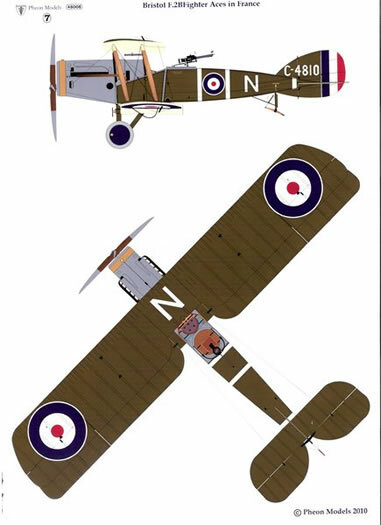 Cockades and rudder stripes are provided for two aircraft to be completed. Pheon have matched the colour to actual samples of WWI VR2/3 and VB3 doped fabric and state it is the most accurate colour representation available using modern printing media. Over the years there have been a number of 1/48 Bristol F2B kits produced including Aurora, Aeroclub and Blue Max. The more recent offerings from Roden and Eduard are the best in terms of accuracy and detail. Given the curious way the Biff’s fuselage is suspended between the two wings, the assembly of the wings to the fuselage can be challenging for less experienced modellers. 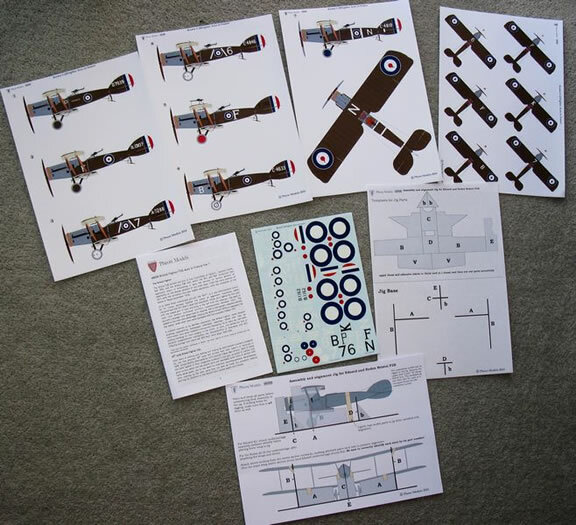 With this in mind, Pheon have included pre-printed parts for an assembly jig, produced on self-adhesive labels in the same fashion as their earlier Sopwith Dolphin and Halberstadt CL.IV assembly jig templates. Stick to thick card and cut to shape. What an excellent idea! The jig has been designed to work with the Roden and Eduard kits but should be useful for older kits as well. This should definitely make assembly easier. This set was Pheon’s very first decal release back in April 2009 and as it has sold out, Pheon have taken advantage of subsequent research to expand and update the set for this 2nd Edition. B2162 66 Sqn. RFC, 2Lt W.A.Pritt. A6156 54 Sqn. RFC, Capt. O.M.Stewart. B1777 46 Sqn. RFC, ‘Chin-Chow’ Lt A.S.G.Lee. A7327 46 Sqn. RFC, Capt S.H.Pratt. N6181 3 Naval Sqn., ‘Happy’, Flt Cdr L.S.Breadner. N6205 3 Sqn RNAS, ‘Betty’ Flt Cdr J.S.T. Fall. N6200 4 Sqn RNAS, ‘Bobs’ Flt Cdr A.M.Shook. N6203 RNAS Seaplane Defence Flight, ‘Mina’, Flt Cdr LH Slatter. ‘Mina’ decals have been revised since the first release and are now ‘handed’ for port and starboard rather than being identical on each side. ‘Betty’ now has optional black letters as well as red. ‘Happy’ now has a white drop shadow lettering. The red with white shadowed letters is provided as an option. A 6194 66 Sqn. Capt L.H.Smith. B1716 46 Sqn. 2/Lt F.B.Barager. N6179 3 Sqn. RNAS., ‘Baby Mine’, Flt Sub-Lts A.W.Carter and J.J.Malone (among others). The 2nd Edition has 16 cockades compared to 12 in the first release. 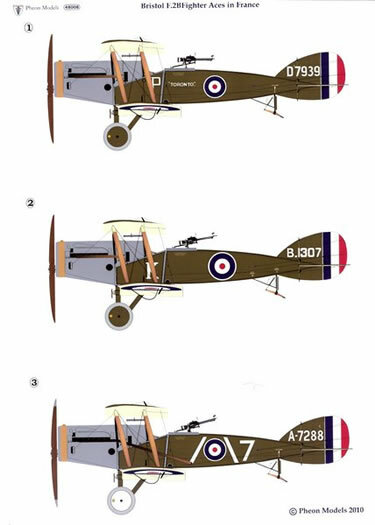 Depending on whether you choose RFC or RNAS options this could enable four complete builds (all RFC machines had white outlined cockades, RNAS Pups had plain cockades). The full colour artwork has been revised as well. B2162 now sports paint chipping on the cowling and PC10 finish around the cockpit instead of plywood. Likewise ‘Chin Chow’, A6156 and A7327 are also now shown with PC10 around the cockpit. ‘Mina’ has a natural metal cowling as an option. B1703 now has red and blue pennants (previously just red). Chutes for spent ammunition cases are now shown on seven of the profiles (these may have to be scratch built). 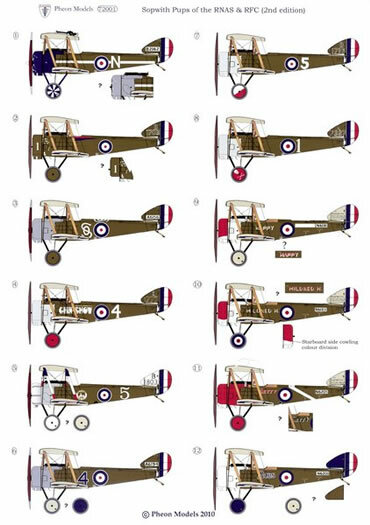 In 1/72 scale the old Airfix Sopwith Pup kit, although out of production, is still readily available second hand and is one of their more accurate and detailed WWI kits. Pheon provide some notes for correcting some minor omissions in the kit. Pheon provide full colour A4 sheets of profiles/placement guides printed on glossy card – three sheets in the Pup set and four in the Bristol F2B set. As always, these cards are very nicely done, top-end quality. 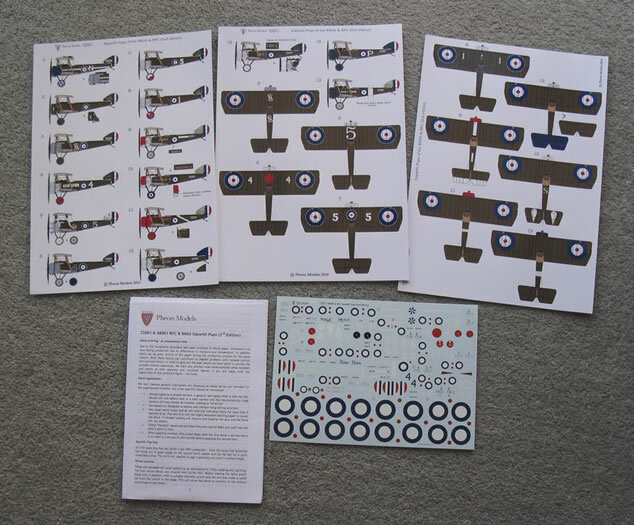 A detailed instruction booklet is included in every Pheon set, covering decal application, colouring notes, references and service history for each pilot and plane. 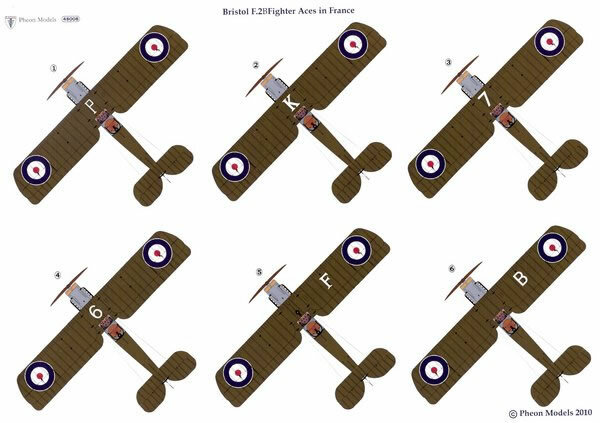 The Bristol F2B Aces sheet offers a good variety of markings to set your Biff apart from the others, with some high scoring crews to choose from. 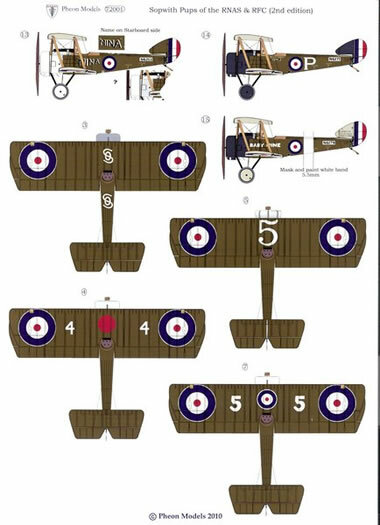 If you missed out on the 1st Edition of the 1/72 Sopwith Pup decals, the revised set offers even better value. With so many colourful options the hardest part will be deciding which aircraft to build. Available only directly from Pheon by email: mailto:pheon.models@hotmail.co.uk.